Hi, I am in my mid 40's and danced for years throughout my teens and 20's and early 30's with no physical injuries or problems. After a 10 year break to raise children, I returned to ballet. As soon as I increased my classes to 3 or 4 and eventually up to 6 per week for a few months, I began having inflammation problems in my left hip in both the front and also along the side where the tensor fascia latae muscle is. The front at times would feel weak and strained or pulled almost like it was going to buckle at its worst, and on the side I would get the shooting, burning pain and this would at times make me limp slightly even when I was still able to dance. I went to an orthopedic doctor and was diagnosed with hip flexor strain and tendonitis. He told me to scale back to 2 classes a week, take a 14 day course of anti-inflammatories, ice after dance and received a couple of stretches for the hip and work my way up gradually. This worked well for 6 weeks. When it came back it was worse than ever and I had to completely stop dancing and needed to wrap my hip to walk. After a couple of weeks I went to massage therapy which really helped my hip, but my patella was gently glided up and down in its groove 4 times during the massage. It did not feel comfortable. This is what began my knee pain 6 months ago. 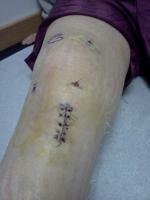 This was also done to my right knee which did not cause ongoing problems. My left knee had never hurt prior to this but it doesn't seem like that would have injured it, maybe irritation though? I went to physical therapy for 2 months and learned the clamshell, straight leg lifts, etc. My knee was starting to get better, and then I encountered a couple of minor bumps. That was one thing that made it flare and then I tried Pilates one time which I think I may have strained my vmo muscle. All that was 3 months ago. I assume is to the inside medial upperside of knee cap, is what most often gets puffy and strained feeling, but I will feel pain all over the front of my knee, the medial kneecap edge , never lateral. Also the top medial tip of my patella looks like it may be tilted a little higher. I've been told I don't have a tracking problem, and I've had 2 negative MRI's. My X-rays were normal with all the articular cartilage there. I also had negative arthritis screen. My hip doesn't bother me at all anymore but I'm wondering if the knee problem is connected to the former hip injuries. The last 3 weeks I have been trying to stretch everything, especially my quads. I also roll the knots out of my left quads with a foam roller. The anti-inflammatories have helped, and my leg is stronger since I don't use my knee brace much and I also do bridges and the quad contraction exercises. I wanted to know with my history if there is a specific area for me to work on with physical therapy exercises. I haven't been involved in any athletic activity since my last hip issue and as I said the knee thing began after I quit dancing. I have been working my walking back up without the brace. The doctor said this would strengthen my vmo. If I increase my activity while trying to decrease my topical anti-inflammatory my knee flares ( it doesn't take much). I don't feel like I limp badly anymore, but it is always slightly tender, and swells minimally, especially around the vmo and fat pad below kneecap. Do you think something is tight from my hip injury that is keeping my knee pain going or could the hip injuries have weakened my hip flexors? I've heard of knee pain following hip problems. Also can a joint become dependent on anti inflammatory? What are the alternatives for inflammation? The pain and minor swelling is primarily with the use of the knee(walking) but not with every step. I do not have pain at rest. I would really appreciate your advice and any helpful insight out there.